If anywhere in Asia epitomizes the freedom and adventure of mountain biking it is Chiang Mai, Chiang Rai and the golden triangle in Thailand. Our mission is to inspire people to travel by mountain bike in order to explore the rural regions of Thailand, meet the locals, enjoy the fresh air and of course, to discover themselves. Our cycling routes are mostly offroad, not on paved roads. Smiles and waves are plentiful as you cycle through rural Thailand. You will soon figure out why Thailand is called the "Land of Smiles". Bring your camera so you can share your experiences with your loved ones back home and so you can remember how much fun it was traveling by bike through the wonderland that is Southern Thailand. 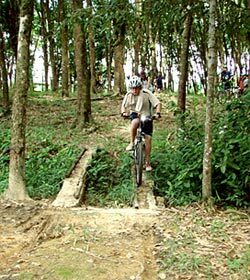 Mountain biking is a sport increasing in popularity in Thailand , both among Thais and young international tourists. It is an ideal means of touring Thailand 's spectacular natural environment; safe, cheap and fun, and environmentally green. Biking is an idel way to explore the country's diverse cultural and natural heritage. 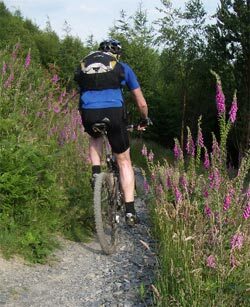 Mountain-bikers both novices and veterans will find challenges galore in the mountainous terrain of the North. The Central Plains, with its archaeological ruins and cultural attractions placed close together in historical parks, offer leisure-biking opportunities. What is the better way to see such a beatuiful country close- up than the bicycle. Imagine, biking along the quiet road, in the shade of rubber trees, coconut groves with sound of birds and insects filling the morning air. You will realize that every moment, how much more enjoyable a place can be when pace is slow down and leisurely, when riding a bicycle in Thailand. Our Bike tour Thailand, allow you to travel through unspoiled scenic area by bike. Biking, especially, is the fantastic way to get off from the beaten track and explore Phuket and around. You can move at a place fast enough to see the landscape changing yet slow enough to appreciate the friendly local people along the familiar sight we riding! We will lead you to see the rich cultures, of the Southern Thailand by bike. A must for families and individuals looking for fun and active way to see the another side of Phuket and South of Thailand. We promise you no crowds and exhilarating experience you will not soon forget with Thailand bike tour. Here valleys that were once host to ancient kingdoms and fields of opium poppies are now home to a colorful hill tribes and some of the most spectacular mountain scenery anywhere. The best way to experience the richness of this region is by bike, faster than walking and more personal than motorbike we follow winding trails to remote villages, seeing elephants at work and visiting Akha, Lisu, and other hill tribe people.